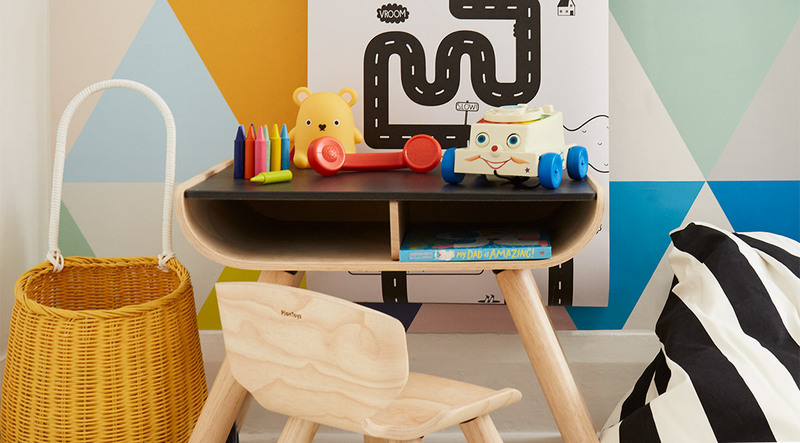 Playrooms are all about fun, but crafting a space that they love, doesn’t have to mean compromising on style. 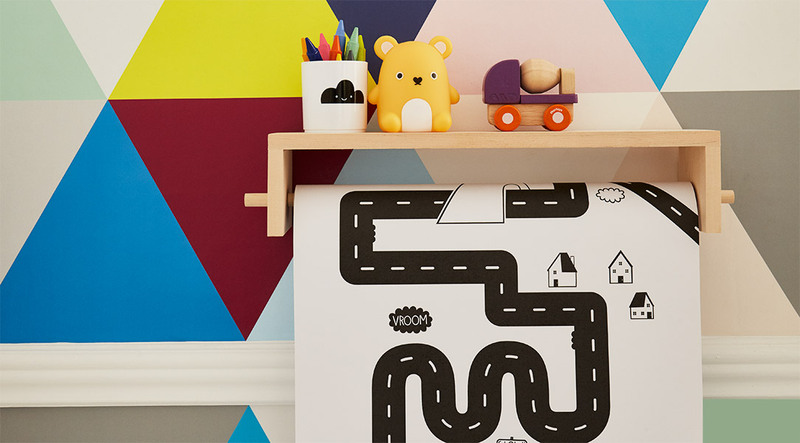 We love using colour and patterns to create an expressive space that will work, not fight with, their toys. Here’s our tips on putting together a stylish look that will still stimulate kids senses. Bold colours on walls create a confident base. We love this unisex, geometric wallpaper from Murals. Its simple design means that it can easily grow with them and mixes effortlessly with their toys and furniture. Relax the rules. Kids love variety and creating different areas where they can do things that are good for creativity. We love the mixing soft seating with more structured seating. This stripe bean bag from Wildfire Teepees is a great choice, so is this Plan Toys Desk and Chair. It’s not a playroom without the play. Display their favourite toys on shelves and mantles, ready for them to grab and play. Easy to rotate, pick out bright colours and fun faces to catch their eye. 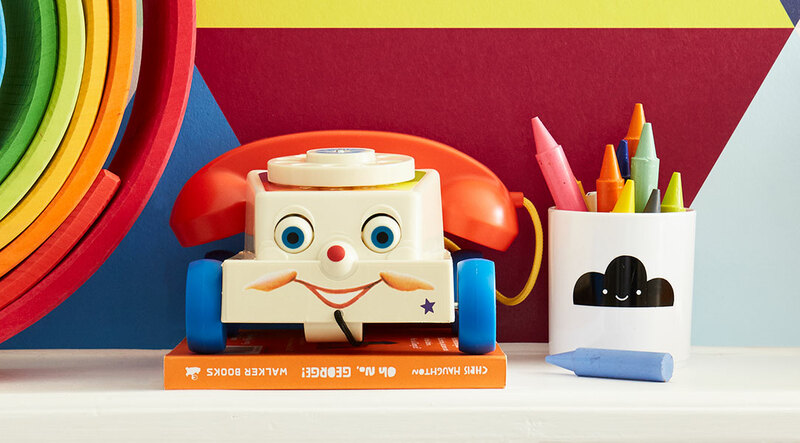 This retro Chatter Phone from Fisher Price is bold and eye catching. Kids will love it. When it comes to storage, make it accessible so that kids can pull out and put away their own toys. 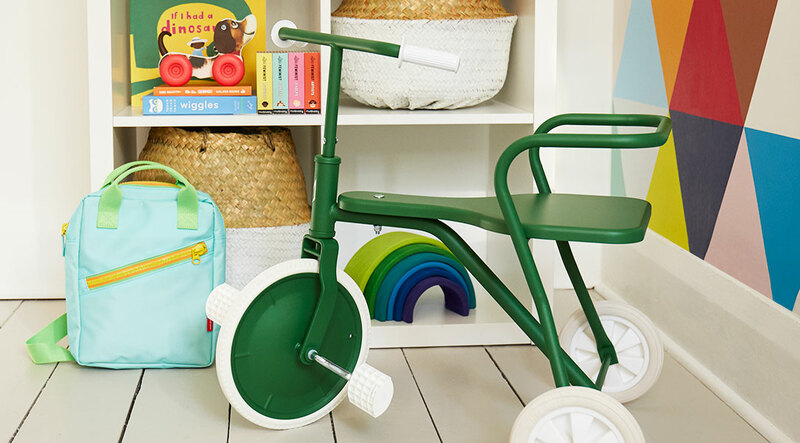 We’re loving the double use of this Olli Ella Luggy Basket, which can also be used as a toy. And the Seagrass Baskets from Bloomingville, look great on a shelf, or in the corners of rooms. Enjoyed this collection? If you’re looking for more room inspiration then we’ve curated each room in the house to help and inspire. Take a look at our tips for putting together a mint or natural nursery. Our articles on creating a family living room and bathroom, ensure you have the perfect space that suits you and them, while our kitchen ideas help create a mess-free, stylish place to eat.